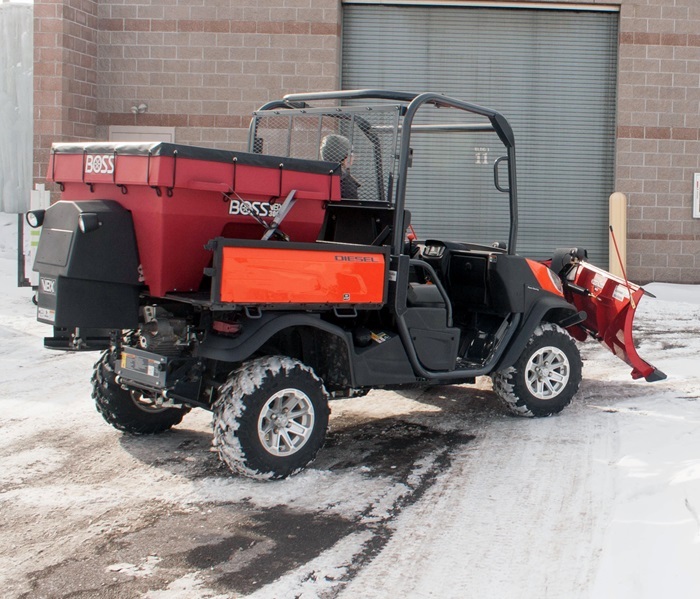 BOSS designs their spreaders for one purpose- making the lives of snow- and ice-removal professionals easier and more efficient. so while the front of your vehicle is fighting to clear the sidewalks and trails of all things snow and ice, the back of your vehicle is putting the finishing touches. When you combine the rugged strength of the BOSS XT snowplow and the precision of the BOSS VBX 3000 spreader, your UTV will become the Ultimate Snowfighter, packing the same punch as the big guys, but in a smaller size. Corrosion Resistant Poly Hopper with 12 cubic feet of capacity. High Torque Gear Motor powder coated for corrosion resistance, reduced maintenance and longer life. 12" Diameter Urethane Spinner with sealed motor for durability and maximum spreading efficiency. Single 55 Watt Halogen Work Light easily turn spreader lights on and off from inside the cab.